With a handful of swimmers out of action, or reduced to one day of competition due to Confirmation ceremonies, the senior and junior squads from Castlebar Swimming Club travelled to Leisureland pool in Galway recently for the Connacht Age Groups. Taking place over two days, the competition is one of the highlights of the Connacht swimming calendar, and it proved to be a fine weekend for the young swimmers who gathered an impressive collection of medals, qualifying times and personal bests. Sinead Mylett, who is having a record season, was crowned Connacht champion in two separate events. 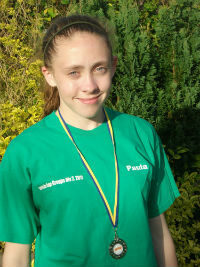 Paula McDonagh who took silver in her age category in the 800m freestyle at the recent Connacht Age Groups in Galway. Taking an impressive nine seconds from her previous personal best time, Breaffy's Niamh Breslin was in fine form on the day, swimming the 200m backstroke in 3:04.68, making her Division 2 time with almost four seconds to spare. Sinead Mylett also continues to impress this season, taking almost five seconds from her previous PB in the 200m backstroke, to achieve a new time of 2:28.35, claiming gold in the process. Her second gold of the day, and another PB, came with her time of 59.42 in the 100m freestyle. Laura Fahy took bronze in the same event with a time of 2:47.20, and knocked seven seconds off her previous PB in the 400m freestyle to comfortably achieve a Division 1 time with 5:19.77. Ten-year-old Hannah Grady had an excellent time of 1:44.52 in the 100m breaststroke, a five second PB. There was another PB for Nicola Connelly in the 50m freestyle, with a time of 37.31, and she also achieved a Division 2 time in the 400m freestyle. The last race of the day was the gruelling 800m freestyle (32 lengths) - a mixed event which saw both boys and girls of all ages take to the water together. Siofra Horan took silver in the 13-year-old age group with a time of 10:16.47, with Paula McDonagh achieving a 35-second PB of 10:33.95 to take silver in the 12-year-old age group. Also impressing in this tough race were Caoimhe Hennigan with a time of 10:32.64, Aoibheann Hennigan with a time of 11:12.49 and Nicola Connelly with 11:18.18. Also swimming well for Castlebar on the day were Ronan Dervan, James English, Sean O'Connor and Louise Dervan. Much credit is due to the young swimmers for their perseverance and hard work, and also to the continuing dedication of their excellent coaches - particularly Marian English and Joe Moran. Their total immersion in this challenging but rewarding sport is hugely admirable, and one for which legions of Castlebar swimmers - and their parents - are very grateful.